Konogoro-gusa ("Grasses of the Present Day") depicts people from diverse social strata and professions: in this case a blind storyteller (kado sekkyō), who is being accompanied by a shamisen player. The text above tells of itinerant singers and storytellers from the province of Ise. 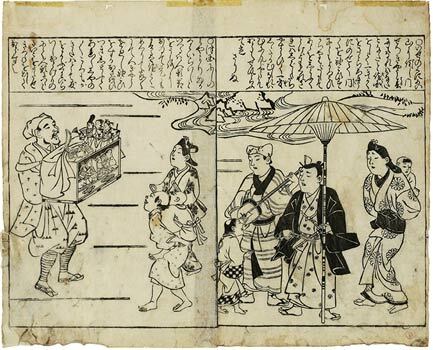 On the left an itinerant puppeteer (karaishi), who is linked in the text to Nishinomiya in the province of Settsu.